There are five MTR courses. Mountain Travel and Rescue Fundamentals and Mountain Travel and Rescue 1 prepare candidates to be search-team members in ground-based search-and-rescue operations. Mountain Travel and Rescue 2 prepares more experienced candidates to serve as task-force or strike-team leaders. 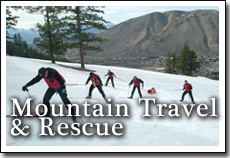 Mountain Travel and Rescue Clinics (with no prerequisites) and Mountain Travel and Rescue Enhancement Seminars (for students who have completed MTR F, MTR 1, or MTR 2) focus in-depth on specific skills for mountain search-and-rescue operations. All courses involve hands-on field sessions; Mountain Travel and Rescue 1 and 2 require overnight field sessions.